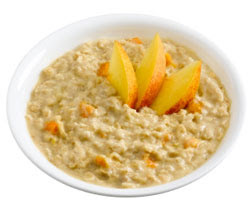 Combine water and oatmel in microwave safe bowl and cook for 3-4 min. when finished stir in Peaches (I like to cut the slices in half), brown sugar, cinnamon and vanilla. Give it a good stir and enjoy!